If it ain’t broke, don’t fix it, is the mantra from Turf Moor this summer. Clarets chairman Mike Garlick says Burnley will continue doing things in their own way at their own pace, despite qualifying for the Europa League after the club’s best season since 1974. Sean Dyche guided the side to seventh place in the Premier League, and while there will be an increased budget available to him, Garlick agrees with the boss in that bar the big six, and, historically, Everton, there is no such thing as an established club at this level. West Brom and Stoke City were widely thought to have earned a place in that bracket, but were both relegated this season, while Leicester City were forced to sack Claudio Ranieri the season after their title triumph as they slid towards danger. Garlick said: “I think you’ve just got to try to keep some sort of momentum going forward and have change happen slowly, no massive tidal waves – either in a positive or negative way, because they just create uncertainty. “If you try to do too many things at once you can upset it. “We work budgets out every year. We know what they are and what we’ve got to spend. 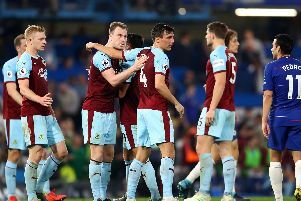 Burnley’s last financial figures showed they spend £50 on wages per £100 of their income, described as an “exemplary business model” in football. So, as Burnley look to build on their success, can they sustain that model, and improve it? Garlick explained: “If you look at the last time it was £28 or something like that, so it has moved up. “It’s moved up a notch but that’s sustainable. “When you look at the new Premier League tv deal, we already know the domestic rights aren’t really increasing that much at all. The international rights go up, but it is slowing down. It will have a knock-on effect. “You’ve got things like the Euro still being strong so bringing in players from Europe is harder as well, it’s not as attractive. You look at the Bundesliga and a lot of the clubs there pay pretty much the same, there’s not much of a differential. “In the French League the wages have gone up a lot. “It’s not getting easier, but having said, that the season we came up two years ago, the season we signed Jeff Hendrick and Steven Defour, that was hard because you’ve got to convince the player that we were going to stay up. “If a big six, big five club comes in for someone it’s very difficult. “I think what we’ve done that’s slightly different is that we’ve hired a lot of players who have got the hunger and the desire, whereas maybe clubs like Swansea or West Brom have hired people that have been paid good money for a long time, they don’t see it as a step up, just a sideways move. “If we can hire people who think this is a step up – it might be a step to something else – but it’s still a step up because it takes me on my journey then that gives us that extra little bit, and it’s fine margins. And the club will continue to try and be competitive in a wage market which has gone through the roof: “I think if players come in and we think they’re going to add to what we do then they’ll be paid at the top end of our wage bracket. “Are we going to push it forward? Premier League tv money will go up a little bit next season so there might be a bit more slack, but it’s not going to be revolution. It’s not going to be the jump that we saw from £28 to £50 from the previous season. The curve will be flattening a little bit. “I think the next three years are fairly secure in terms of monies. After that it depends do your Amazons and Apple take off? There could be real opportunity. “I think there’s a lot more mileage in the non-broadcasting rights side of things, monetising our players and how many followers they’ve got on YouTube and whatever we can get in far flung parts of the world.